The first day of the month of May is known as May Day. It is the time of year when warmer weather begins and flowers and trees start to blossom. It is said to be a time of love and romance. It is when people celebrate the coming of summer with lots of different customs that are expressions of joy and hope after a long winter. Although summer does not officially begin until June, May Day marks its beginning. 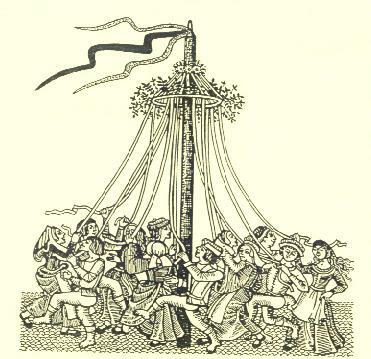 May Day celebrations have been carried out in England for over 2000 years. The Romans celebrated the festival of Flora, goddess of fruit and flowers, which marked the beginning of summer. It was held annually from April 28th to May 3rd. The rest of the day was given over to various festivities. There was dancing on the village green, archery contest and exhibitions of strength. The highlight of the day was the crowning of the May Queen, the human replica of Flora. By tradition she took no part in the games or dancing, but sat like a queen in a flower-decked chair to watch her ‘subjects’. There was once a tradition in England of ‘lifting’ where a gang of young men would lift a pretty girl in a flower bedecked chair on May day. Then the girl would choose a boy on May 2nd. Great idea. Our group should start celebrating May Day for the coming of winter after a long stinking hot summer!!! I miss the old country traditions here.